Bear with me, I'm so out of practice with this blogging thing that I'm gonna have to ease back into it ;) haha. As some of you may know (but others may not!) I'm finally done traveling for a bit and hopefully can get back into a groove with the horses again. Going in to this winter I kind of knew December and January would be a wash, between weather and spending 3+ weeks traveling (plus all the time prepping the farm for travel, which is sometimes more stressful than the actual traveling), so I didn't let myself feel (too) guilty about the horses going essentially feral. And while I did manage to squeeze horses into this second trip (more to come on that later, I'm still sorting through the thousand or so photos DH took! ), I also came back refreshed and ready to hit the ground running with Ruby and Cinna. 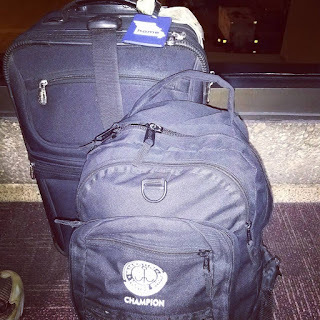 Seeing my "CHAMPION" backpack every day might have been slightly motivating, haha. I flew home from vacation on a red-eye Friday night, meaning A) I got ZERO sleep on the plane because that's just not how my brain works and B) we got home early afternoon Saturday when it was sunny and 50s. That was SUCH an improvement over how it was when we left (it didn't make it to double digits the day before we flew out) that I was determined to get something done with the horses. Also I knew if I sat down I would PTFO and I was desperately trying to stay awake and adjust to this time zone again, lol. Unfortunately the warm weather coupled with precipitation while we were gone meant the horses were MUD MONSTERS, ughhhh. After I essentially had to comb out a third of her dead, matted mane. It desperately needs to be shortened. Or roached. Cannot deal with all this hair. 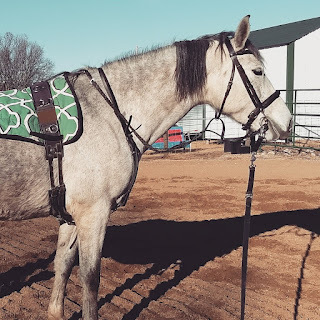 I was probably overly optimistic when I dressed in riding clothes, because about the time I got Ruby in the cross ties and looked at all 16+ mud-covered hands of her, I realized I did NOT have the energy to deal with cleaning her up and then riding (plus doing something with Cinna after). But I did want to do SOMETHING, so I knocked the worst of the mud off, and took her out to lunge. I expected some dramatics, considering the time off and the weather, but she was insanely perfect. Every transition was prompt and polite, and she picked up a lovely soft canter -- not even a hint of zoomies. 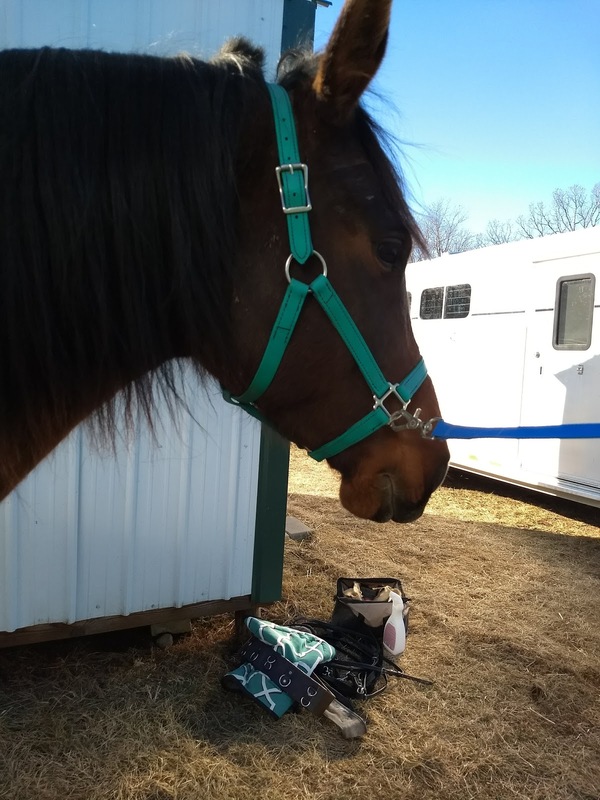 In deference to her winter coat, the weather, and a general lack of fitness, we kept things short, but she didn't put a hoof wrong the whole time, so I stuffed her full of cookies and tossed her back out. 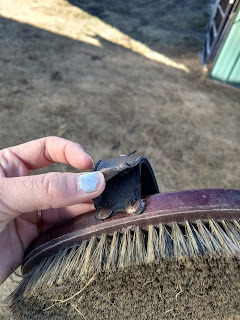 Also need to update my review of the Horze brush apparently, which is falling apart after a little more than a year of very light use. Disappointing! I grabbed Cinna next, and was rewarded with another really good lunge session -- we had one minor exuberant transition/tantrum and then bolt one direction when I asked her to canter, but considering how often we still get those even in regular work, that's barely noteworthy for her... haha. She was anticipating the trot a lot when she first got out, so I think in the future I need to be more mindful of doing plenty of walk work on the lunge. My notebook for ride/work tracking still isn't here, so I'll keep making those mental observations here, so I can copy them over once it (finally) gets here (hopefully this week??). She was solid in switching directions this time though, so I think that button is more or less installed, although there is always room for refinement. Even a smidgen of lipstick after our short session. awesome that you came back from your break feeling refreshed and ready to go with the horses! but the mud... .ugh the mud. it's definitely mud season here now too. blech. super lame about the horze brush too. mine is still basically in perfect condition with daily use, but my handle is also a different material than the one in your picture (it's kinda a canvas, i think?). We have such a *lovely* clay based mud too (/heavy sarcasm). It's a bugger to get off, ughhhh. Glad to hear your horze brush is holding up better than mine! Welcome back. I am astounded that you could even lunge after that trip! I saw some photos on FB and I'm totally jealous. I had to do something because I knew it would be cold and gross today! Couldn't waste the sunshine and warm weather, haha. Can't wait to see vaca photos! Welcome back! Hope we get to hear all about your trip! Your insta photos are fantastic! I think Ruby must have missed you. She's all "I'll be good, don't leave me!" Haha she was so very good and snuggly. When I walked out out to the barn I called her name and her head snapped right up! Haha I do not blame you, getting horses decrustified takes a lot of elbow grease (my right shoulder always protests!) Glad you had good travels and welcome back! Soooo jealousssss ;) glad Ruby and Cinna didn't go completely feral while you were away (even if they looked it). If we have another warm weekend, we should try and get together - it's been forever! Yeah for sure!! Hopefully we're through the worst of this cold snap so we can start doing fun horse things again! Welcome back!! And what good girls to come back to work so well! They were super good, especially since I'm sure my zombie-like lack of sleep made me a good second or two slow on reaction times haha. Bless them!